Structural reforms feature prominently in the political agenda of many countries in a bid to promote and sustain economic growth. And yet, the pace of reforms slowed down during the recent recession and subsequent sluggish recovery, both in developed and emerging economies (OECD 2016, IMF 2016a). These trends have partly been traced to increasing concerns that, despite their perceived long-term benefits, structural reforms may entail costly transitory adjustments whose burden becomes especially worrying in periods of persistent economic and employment slack. But are such concerns grounded? In theory, product or labour market reforms may induce temporary losses in output or employment in the presence of market frictions (Gerali et al. 2015, Cacciatore and Fiori 2016). In practice, however, little is known about the empirical relevance of such losses, or, perhaps more importantly, whether appropriately designed policies could help attenuate them (see Boeri et al. 2015, IMF 2016b). In a recent contribution (Bassanini and Cingano 2018), we attempted to make progress in answering these questions, focusing on the short-term responses of employment to reforms removing barriers to entry in product markets (PMR reforms) and lowering the cost of dismissals (EPL reforms). Drawing on more than 30 years of cross-country industry data on OECD countries, we show that both product market reforms and EPL reforms entail non-negligible – though transitory – employment losses on average. 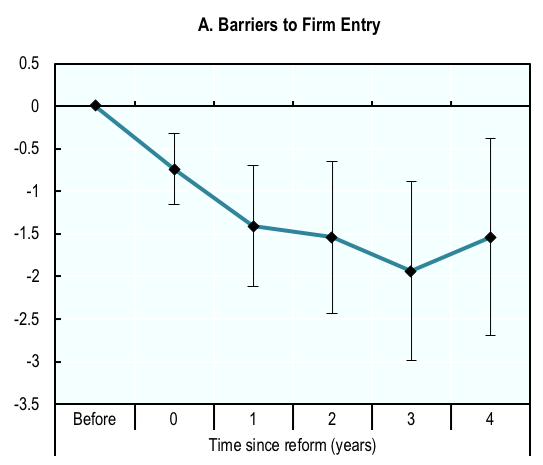 Panel A of Figure 1 shows, for example, that a reduction of barriers to entry in network industries induces employment to fall below its pre‑reform level during the first three years (with a maximum loss of nearly 2% in the 3rd year). Similarly, Panel B shows that one year after the ‘average’ reform of dismissal legislation (i.e. one lowering the OECD indicator of EPL, as in the average of all the reform episodes in the data), employment in dismissal-intensive industries is around 0.5% below its pre-reform level (relative to other industries). Note: The chart reports point estimates and 90%-confidence intervals of the cumulated employment effect of structural reforms. Panel A reports the employment response to a reform of product market regulation (PMR). It is estimated on data on network industries (Energy, Transport and Communication) across OECD countries and corresponds to a reform lowering the regulation index (the OECD-ETCR index) by one point. For reference, such a reduction occurs over a 2-year period for 1/3 of the reform episodes in the data. Panel B reports the differential employment response to an "average" reform of employment protection legislation (EPL) for regular contracts (one reducing the OECD indicator by 0.2 points) between 2 industries whose dismissal rates differ by 1 percentage point. Employment levels before the reform are normalised to 0. These findings are obtained accounting for a number of confounding factors, including country-industry trends (capturing specialisation patterns, trends in regulation), country-specific yearly shocks (capturing the business-cycle, ‘waves’ of reforms, etc. ), and industry-specific shocks (as technology or demand shocks). They also proved robust to a large set of specification and sensitivity checks, to tests for reverse causality, and to using political variables as instruments for changes in regulation (as in Bertrand and Kramartz 2002). These negative short-term consequences illustrated in Figure 1 can be contained, according to the analysis. For one thing, employment losses turn out to be smaller, if not negligible, for product and labour market reforms implemented during economic upswings. Indeed, when aggregate output is growing above its potential, as usually occurs in the years following a recession period, hiring is scaled up while there are no or few inefficient jobs to be destroyed. Moreover, we find that the costs of easing dismissals legislation are negligible when product market regulation is light. Because the reverse does not hold (the costs of lowering entry barriers are found to be higher when employment legislation is light), the analysis has implications for the sequencing of product and labour market reforms. It suggests that a highly regulated country interested in reforming both domains could minimize the short-term costs of its policy package by deregulating product markets before the labour market (as in Blanchard and Giavazzi 2003). 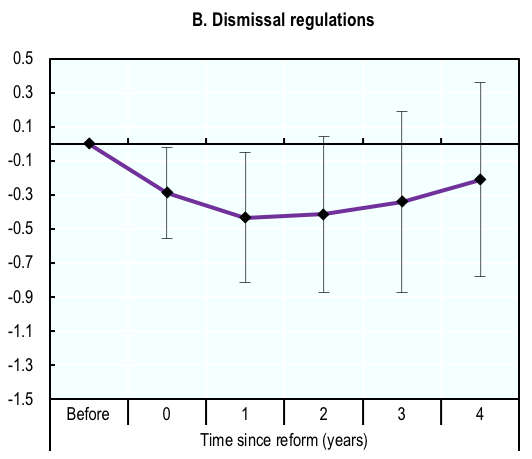 Finally, we find that employment losses from reforms of EPL for regular, open-ended contracts are less acute in countries with significant labour market dualism, where volatile positions are typically filled with temporary contracts whose cost of termination is unaffected by the reform. This result is remarkable because lowering dismissal regulation on permanent contracts is probably the single most effective way to tackle segmentation between protected permanent contracts and precarious temporary contracts (OECD 2014). In other words, EPL reforms are likely to come at no cost (to employment) in those countries where they will bring the greatest benefits (to duality). Notes: Estimated employment responses to EPL reforms in labour markets with different shares of fixed-term contracts (“duality”). Each line represents the differential employment response between 2 industries whose dismissal rates differ by 1 percentage point to an "average" reform of employment protection legislation (EPL) for regular contracts (one reducing the OECD indicator by 0.2 points). Employment levels before the reform are normalised to 0. These qualifications find further empirical support from studying the case of three recent EPL reforms (in Estonia in 2009, Spain in 2012, and Slovenia in 2013). The reforms were implemented at different stages of the business cycle (the onset of a large downturn in Estonia, and just before the crisis trough in Slovenia and Spain), in countries with significantly different degrees of labour market segmentation (very small in Estonia, average in Slovenia, and close to the largest in Spain). Combining micro and aggregate data for each country, we focused on the responses of unemployment around each reform. Consistent with the results from the cross-country analysis, Estonia experienced the highest increase in unemployment, whereas the effects of the reform were smaller in Slovenia and statistically insignificant in Spain. Authors’ note: The views expressed here are those of the authors and do not necessarily reflect those of the Bank of Italy, the OECD or its member countries. Bassanini, A, and F Cingano (2018), "Before It Gets Better: The Short-Term Employment Costs of Regulatory Reforms" Industrial and Labor Relations Review, March. Bertrand, M, and F Kramarz (2002), “Does entry regulation hinder job creation? Evidence from the French retail industry”, Quarterly Journal of Economics, 117 (4), 1369-1413. Blanchard, O, and F Giavazzi (2003), “Macroeconomic Effects of Regulation and Deregulation in Goods and Labour markets”, Quarterly Journal of Economics, 879-906. Boeri, T, P Cahuc, and A Zylberberg (2015), “The Costs of Flexibility-Enhancing Structural Reforms: A Literature Review”, OECD Economics Department Working Papers no. 1227. Cacciatore, M, and G Fiori (2016), “The Macroeconomic Effects of Goods and Labor Markets Deregulation”, Review of Economic Dynamics, 20, 1-24, April. Gerali, A, A Notarpietro, and M Pisani (2015), “Structural Reforms, Investment and Zero Lower Bound in a Monetary Union”, Proceedings of Centre for Growth and Business Cycle Research Conference, The Manchester School, University of Manchester, 83 (9), 120-139. IMF (2016a), “A Guiding Framework for Structural Reforms”, Staff Note for the G20. IMF (2016b), “Time for a Supply-Side Boost? Macroeconomic Effects of Labor and Product Market Reforms in Advanced Economies”, World Economic Outlook, chapter 3, April 2016. OECD (2016), Economic Policy Reforms 2016 Going for Growth Interim Report, OECD Publishing, Paris.